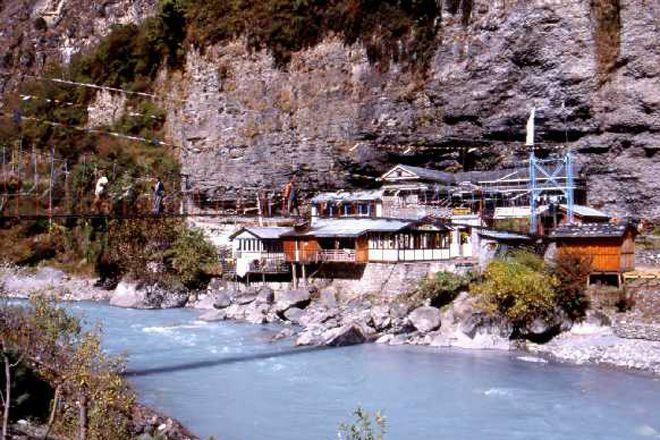 The town of Chame, where Annapurna Circuit trekkers can visit the hot springs. While trekking the Annapurna Circuit, there is one particular feature of the always-astonishing landscape that comes as a welcome sight to travellers: hot springs. There’s nothing quite as good as the chance to warm up and wash off the dust of the journey in water heated by the earth itself. Our Annapurna treks feature several such opportunities! The temperature of rocks increases with depth, known as geothermal gradient. A hot spring occurs where groundwater has been heated by hot rocks, either deep in the crust or in areas of volcanic activity. Water then flows to the surface and emerges, producing wonderfully hot sources of water for weary travellers to bathe in. In Nepali, hot springs are known as tatopani (literally ‘hot water’) – so no prizes for guessing what natural feature you might find in the town of Tatopani! This is the most famous hot spring site but there are many others to be found in the Himalaya. The Annapurna Circuit passes through or near several of them. One of our first stops is Chame, where steaming water wells up from the ground near the picturesque river. Later on in the trek, we will encounter more of these natural phenomena. Trekkers always seem to relish the chance to stop at some of these and soak while enjoying the mountain atmosphere and contemplating the journey ahead. According to local lore they are a source of healing for a number of ailments – certain springs will also be afforded cultural significance by those living near them, so remember to treat them with respect, and enjoy!